From l to r: Sean Hammond Express Newspapers, Catherine Hayes HSBC, Rebecca Dack Signs Express, Craig Brown Signs Express, Brian Smart, British Sign & Graphics Association. This prestigious British Franchise Association Award highlights the innovative methods franchisors are adopting to effectively develop their brand to boost their potential for the future and includes entries from all industries operating as franchises. The Awards, now in their 24th year, showcased the UK’s most exceptional franchisors that are driving business success through best practice, innovative strategies and building strong brands. 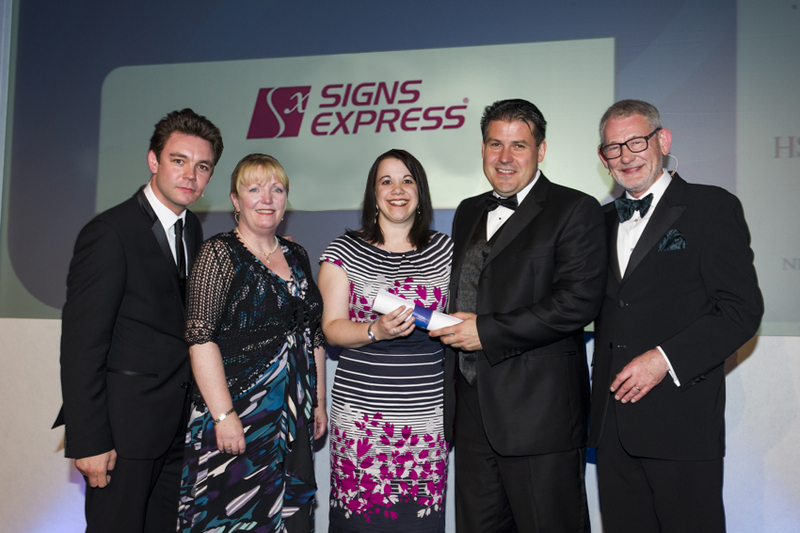 Founded in 1989, Signs Express has grown steadily to become the UK’s largest specialist signs and graphics company. The network comprises over 70 franchise sign production centres, employing approximately 600 people across the UK and Ireland. Signs Express has had previous successes in the annual awards, having been shortlisted in the past consecutive five years for both Franchisee of the Year and Franchisor of the Year Awards, testament to the strong network and brand ethics. In July 2011 Signs Express commissioned its first ever national customer survey of over 1000 businesses, to learn what its SME customers really thought. The survey findings formed the basis of a nationwide PR campaign which benefited individual franchisees as well as the overarching brand, as well as proving valuable research data, which has helped shape the company’s brand. The results for Signs Express showed that it was clear that its visual identity did not reflect the values and perceptions of thebrand and that it needed to update. Signs Express wanted to embrace the fact that it is a brand with tradition and heritage; whilst at the same time demonstrating that it is a forward thinking, innovative, agile and current organisation. Accordingly, it developed a new brand proposition that runs through every area of its business, from visual identity to staff training; internal systems to PR. Using focus groups and a national survey helped to shape the direction of the re-brand and the company took the opportunity to refresh its logo by using a new bright and engaging colour palette, giving a fresh energy. In fact, all elements of the brand have received a fresh new look; from signage, literature and press advertising through to the company’s website and now the new company vans; which will be seen driving across the length and breadth of the country.